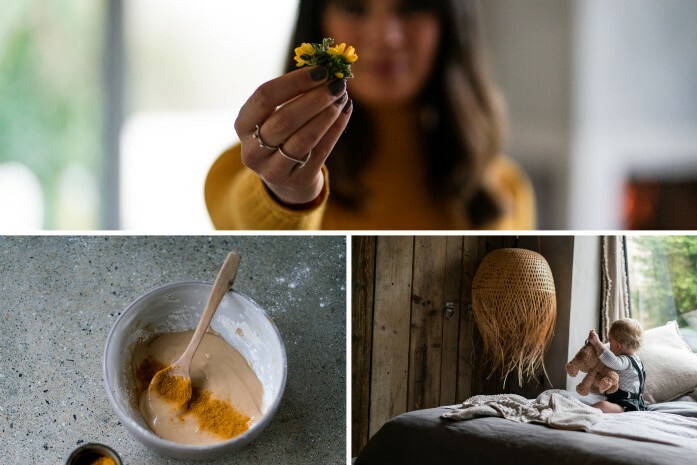 This month we welcomed Jam Jar Jess to our modern rustic paradise, The Hide, to shoot her latest recipe of stem ginger, lemon and turmeric loaf. 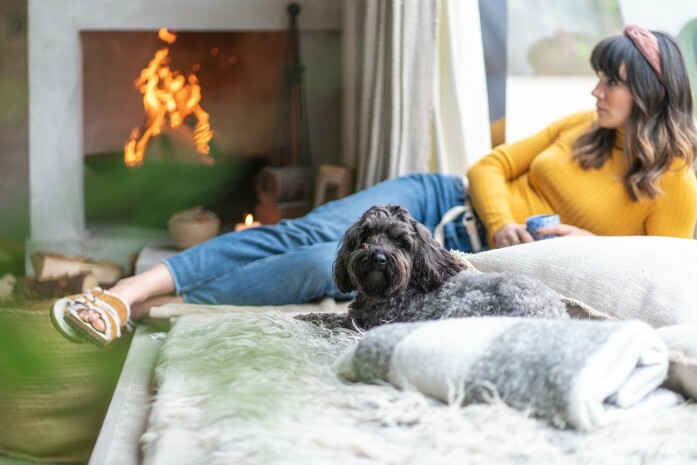 Often referred to as the ‘cuddle in a cake’ by her customers due to its medicinal and warming ingredients, this sweet sensation is accompanied by a sharp and zesty icing. Mix together the eggs and melted butter, then add in the brown sugar, ground almonds and flour. Once combined, stir through the dried spices, stem ginger and lemon zest. Pour the thick batter into a lined loaf tin and bake at a low heat of 165 degrees for anything between 45 minutes - 1hour, depending on the strength of your oven and depth of your tin. After 45 mins poke the centre of the cake with a sharp knife and when it comes out almost clean it is ready to come out of the over. Leave to rest in the tin. 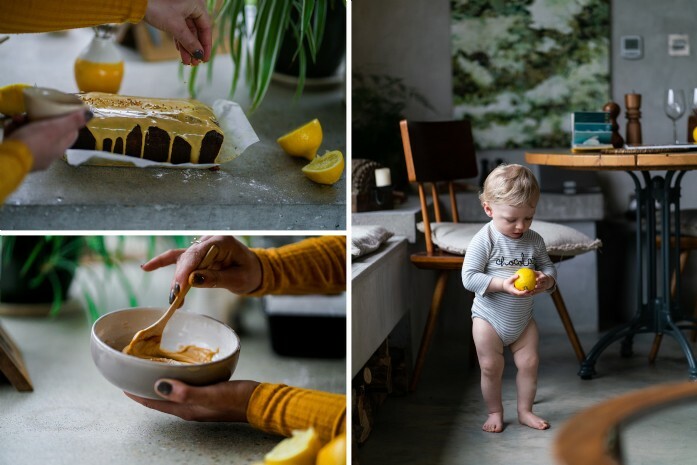 When the cake has completely cooled you can make a glaze by mixing the icing sugar and lemon juice, adding just a little at a time until reaching the desired consistency. It can be made thin for a drizzle effect or simply add less juice for a thicker, more decedent frosting. 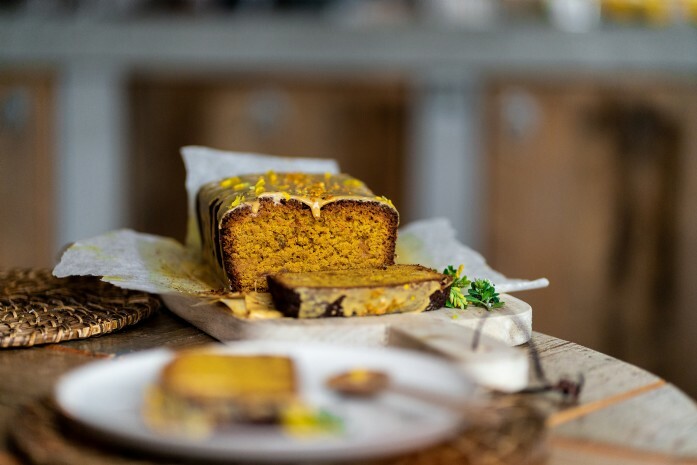 An extra pinch of turmeric to the icing will add a beautiful golden hue. Finally, add a sprinkle of edible flowers to the top whilst the icing is still tacky, so they stick. Enjoy with a steaming chai latte, sprinkled with turmeric! 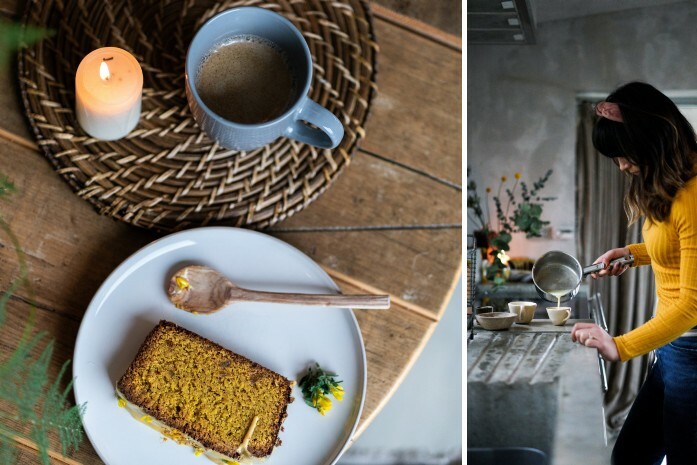 Baker and cafe owner, Jess loves creating vegan and gluten free treats filled in her Newquay-based eaterie.